Redefining the Face Of Beauty : HOW TO RECEIVE CRITICISM! Just as there is a right and wrong way to give criticism, there is a right way upon which we should receive the information. Below is a list of the do's and don'ts of receiving criticism. Always acknowledge who and where the criticism is coming from. If it is from someone that you do not get along with, then it is a high possibility that the person giving you feedback can be biased in their thinking towards you and it may come out raw or hurtful. Recognize that EVERYONE makes mistakes and we all could use a little "constructive criticism." 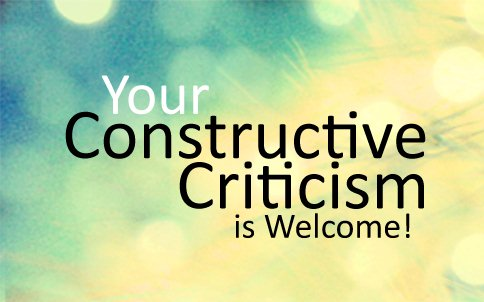 Constructive criticism if done in the right manner should be used as a personal gauge to better yourself, not to destroy you. Ignore the criticism if it is coming from only one person. The majority rules. For example, if seven people tell you that you are a fantastic listener and one person says you are horrible, learn to always go with the majority in constructive criticism. Never try to make another person feel bad because someone made you feel horrible. This method is cruel and it will most likely come back to haunt you whenever you treat another person with disrespect. Do not spend days crying over a criticism. Take it for what it is, work on changing what needs to be changed. Getting upset about our imperfections is normal, however, if you choose to let it take over you then you will never fully become a better person. If a person is willing to give good constructive criticism, thank them. As hard as it is to receive solid feedback, it is just as hard for some people to give feedback. Do not grow bitter towards someone who may have given you feedback in the wrong manner. Always look at the intent of the heart. The person who is giving you criticism may not have known that they did it in an inappropriate manner. NEVER give feedback to random people that you do not know. If you don't know a person, it is never your job to come up to a person and tell them that blue is not their color. Constructive criticism is only effective when it comes from someone that you have a current or previous relationship with. Follow these simple Do's and Don'ts of receiving constructive criticism and it may just help you become a better person. TOP HIGHEST PAYING JOBS FOR WOMEN 2012-2013!